Marietta Borough Hall is located at 111 East Market Street, Marietta PA 17547; phone: 7. Photo: Joseph Bucher House, ca. 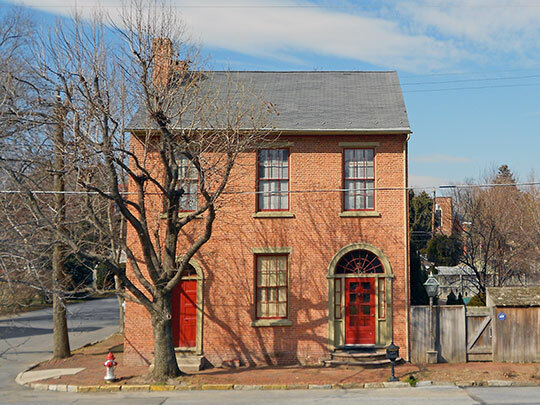 1806-1811, 104 East Front Street, Marietta, PA. Listed on the National Register of Historic Places in 1979. Photographed by User:Smallbones (own work), 2012, [cc-by-1.0 (creativecommons.org/publicdomain/zero/1.0/deed.en)], via Wikimedia Commons, accessed January, 2016. The Marietta Historic District was listed on the National Register of Historic Places in 1978. Text below was selected and transcribed from a copy of the original nomination document. The Historic District of Marietta consists of about 136 buildings of mostly 19th-century date. The buildings west of Market Square are almost exclusively residences. East of the square there is a gradual transition to a commercial district. Front Street exhibits a similar pattern but is more generally residential in character. No building in the district is higher than three stories: most are either two or three stories high. Principal materials used are wood (usually clapboard) and brick. In some cases, synthetic covering or paint has obscured the original character of building materials. Stylistically the district contains a well-blended assortment of vernacular, Federal and Victorian architecture. The major intrusions in the district are: a Mobil Station at Market and Perry Streets, a warehouse area on Waterford and a Texaco Station on West Market Street; and an area of 20th century houses on East Front Street. The historic district in the present town of Marietta offers a very well-preserved example of an early to mid-19th century industrial town. Marietta suffered a drastic economic decline after about 1875, from which it never recovered. The town today therefore has an unusually large number of extant 19th century edifices. Within the boundaries of the district, the architecture varies considerably in style, but was built within a relatively small time span. The variations provide an illumination, of the structure of society in an industrial town. They also reflect the economic focus of the town, i.e., on lumber. The historic district offers insight into the era of individuals in small industry, before the introduction of large corporations and mass production. Industrial manager's houses reflect the taste, money and education which followed prosperity, while craftsmen's hotels and foundry workers' tenant houses recall the less genteel life of the riverman and iron worker. The town of Marietta was actually formed out of three settlements: New Haven, founded 1803, Waterford, 1804, and Irishtown, 1813. By 1814, there were over five-hundred taxable inhabitants of the town. The Pennsylvania Gazetteer of 1832 notes that Marietta boasts "one hundred dwellings, several stores and taverns, and a church" and that it was "now a thriving place, very favorably situated," for economic progress. The early growth and most of the subsequent expansion of the town were due to the lumber industry. During the early 19th century, timber was being cut upriver, in the forests of central Pennsylvania. The logs were then floated down the Susquehanna. In the early 19th century the transport of these logs was often an individual entrepreneur's undertaking. He would make rafts of the cut logs, and float them down the river to settlements where they could be milled. Sometimes the settlements would serve as rest-stops for the rivermen before they continued downriver, and sometimes the rafts would be dismantled upon reaching a town and sold for milling. Another alternative was to sell them to a middleman who bought large quantities of rafts and sent them further downriver. Marietta served in all of these capacities. It was an inland port. The town's economy was also aided by the Pennsylvania Canal, built in 1825. At one time there were four remaining lumber mills in Marietta, among them those of P. Cassels (1807) and B. F. Heistand (1850) who also was a middleman of the type described above. Thus Marietta took its early character from the lumber business. The large numbers of transients generated by the seasonal nature of the river traffic made Marietta a wild and rowdy town. Of this aspect of Marietta's history, most remaining evidence is on Front Street. The street reflects Marietta's early days in several ways. Many of the old (1815-1830) buildings are built of wood, usually with clapboard siding. Wood construction is an obvious consequence of the ready availability of lumber. It is unusual because it is very distinct from most building of that date in the Lancaster County area, which are stone and brick. The early uses of the buildings were probably used as taverns, bawdy houses, and perhaps stores. There is one hotel remaining in the area (the Swan Inn), and several other buildings were probably used as taverns. The river business produced an entirely different sort of entrepreneur, who is also represented in the architecture of the historic district. This was the person who took advantage of the river trade and of his supply of capital to begin business, shipping and storing such items as coal, grains, flour, provisions and whiskey. A few of these people became rich, their wealth stimulated other aspects of Marietta's economic and cultural growth. Architecturally, this group of people is represented in the five brick homes on Market Street and Market Square, particularly the Mehaffey, Duffy, and Houston houses. The Mehaffey and Houston (Shelly) houses are elegantly appointed examples of Federal architecture, while the Duffy mansion is a well-preserved edifice in rural mid-Victorian style.